To learn more about Tadeo Turtle visit Tadeo’s Page. Tadeo is a turtle. He’s not like other reptiles. His body is protected by a thick shell. In this story told by Author Janis Cox, Tadeo doesn’t realize the importance of it. One day, he meanders around his pond at turtle speed. Along the way, Tadeo meets two curious creatures – a squirrel and a cat. The squirrel can run and climb trees. From the squirrel, Tadeo learns that his name is Sammy. Tadeo Turtle can’t reach far like Sammy, but this doesn’t stop him from trying. He takes off his shell, because he wants to be just like the squirrel. Afterwards, he comes across a hungry feline who mistakes him for a rat. For protection, Tadeo Turtle finds his shell. He climbs back up into it for safety. At the end, Tadeo realizes that his shell fit him perfectly – just like God created it to do. Read more. Tadeo (TAHD-ay-OH) Turtle seemed content until he met Sammy Squirrel. Sammy could climb trees and run. Tadeo could not. He has a dream where he lets the shell on his back go, giving him free range of movement. He, then, becomes vulnerable to the attack of Cat. He no longer has his shell to hide under and within. The dream stirs him to think about the way God made him and why it is important to accept himself the way he was created. God makes us each in His image and for His purposes. May we accept this beautiful gift as Tadeo learned to do. This short book has a lesson for children and adults alike. How often do we wish we were like someone else or had things that others have? Tadeo Turtle is a simple rhyming story for the young. Janis Cox illustrated the animals and scenes in luscious, colorful watercolors. They are so beautifully painted. It is a delightful book to read and to look upon. Read more. Retired elementary school teacher Janis Cox employs her experience to create a delightful children’s book with Tadeo Turtle. Written in rhyme, the book follows the adventures of a turtle who wishes he was more like other animals. The message emphasizes how each of us has been created perfectly for the role God holds for us. While the story makes a great read-aloud for younger children, first and second grade students will find they can read for themselves most of the time. The rhyme pattern and word choices help them sound out words they may not have seen before. 5 Star Great book that teaches being comfortable in your own shell. This morning I was delighted to read a children’s book – “Tadeo Turtle” by author Janis Cox. This is a tale of a turtle who struggles to accept himself as God created him to be. Janis tells the story so simply, with words that weave and rhyme, which will draw a child in and hold their attention. She has included her own illustrations, which are both compelling and precious. Having read this on the heals of Thanksgiving, I found the book also drives home this truth: we should be thankful for who God created each of us to be. Janis has based her tale on the truths found in Psalm 139:13-14, NLT. The author includes four crafts to reinforce the tale which are simple for any elementary age child to do with assistance. The completed projects will be a delight to each child. She has also developed a complete curriculum to go along with this book which can be incorporated into the following seven content areas: math, language, music, Scripture study, science, art and physical education. That can be obtained through her website as well. Janis is a wife, mother, grandmother and a retired school teacher. Her love for both her God and for children shines through each page of this book. This book makes a wonderful addition to any personal or school library. **I was given all materials in exchange for my opinion. The opinions expressed here are all my own and this book was truly a joy to review. I love Tadeo Turtle. 🙂 I actually bought him on my kindle to read to my little nephew this Christmas, but my 10 year old daughter fell in love with him as well, so we’ve transferred to her kindle, which is fancier and has better showcase of Janis’s artistic talents. 🙂 My nephew is in kindergarten and he has Autism. He has already memorized the book and quotes it to his friends. I don’t know if he quite realizes how much it fits for him, with his autism, but the grownups in his life sure do, and we appreciate it! Tadeo’s shell also called to mind devices that help the disabled (since I am disabled), like wheelchairs, leg braces, etc. Those are things that we may feel self-conscious of, as children and as grown-ups, but they are God’s blessing to us to help us be all that we can be. This would make a perfect book marketed for special-needs children, as well as a great self-esteem book for all. Here are some words from customers. You can find more at Amazon.com. My grandma gave me this book and I like it. Everyone loves the crafts!!! The lesson is learn to love yourself. Michael Marinelli – 8 years old. I got this book for my nieces and love it. The illustrations are great but what I like the most is the message of the story. Tadeo turtle wants to be like the other animals and get rid of his shell. However, he learns that he was created the way he is for a reason and learns to accept himself. Tadeo Turtle is a wonderful children’s parable that left me in awe of Janis’s abilities as both a writer and artist. 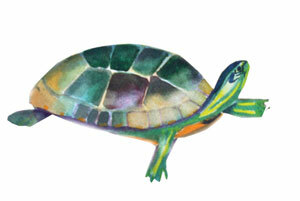 The artwork in Tadeo Turtle are vibrantly gorgeous water-painting, illustrated by Janis herself. The story itself is written in a fun rhyming scheme that is sure to delight all children. The message conveyed by Tadeo Turtle is something children should know early on – to accept how God has created each one of us. Through Tadeo, Janis conveys this message in simple terms that is sure to get across to little ones. I also love that the book itself has fun ideas for crafts included that relate to the story.